Fudge Striped Cookies – Buttery shortbread cookies sandwiched with chocolate ganache and striped with chocolate. Happy New Year!! I hope the hangover has worn off by now. If you’re like me, you’re struggling on your first day back to work – not from all the alcohol, but from the first early morning since I took off before Christmas. This week is gonna be rough. I know I’m supposed to starting a healthy month of salads and smoothies. But this week is rough enough as it is. So I’m still going to enjoy my comfort foods for one more week, mmkay? And, let’s not forget, it’s a new month so that means I need to share a new cookie recipe with you guys. So the healthy recipes will have to wait. For this month’s cookie recipe, I was inspired by a recipe that Sally from Sally’s Baking Addiction shared a few months ago. They’re shortbread cookies loaded with fudgy ganache. In other words, right up my alley! I knew I had to give them a try. I made these cookies over the holidays and loved them so much that I had to share them with you. That fudge center really hits the spot! Without further ado, I present to you Sally’s Fudge Striped Cookies! The process of making these cookies is very similar to the Raspberry Almond Linzer Cookies that I made last month. If you made those (or anything like it), these cookies are going to be easy for ya. These aren’t the kind of cookies to make in a rush to take to a last-minute girls dinner. Nope. These cookies take time. Plus, if you want them to look pretty, you can’t rush through the process. So I recommend doing them on a rainy Sunday when you feel like spending some time baking up a storm. Do not skip the chilling step for the dough. It is very important for shortbread dough to be cold because it is mostly butter. If it gets too warm, it will become impossible to work with and spread a lot as they bake. In all, you’ll be baking 72 cookies (which make 36 fudge striped sandwiches). Odds are that you’ll need to reuse baking sheets (I only have 3 good-quality sheets so I definitely did). Let the sheets cool before you use again. This will make sure the cookies don’t overcook. I place my baking sheets in the fridge to speed up the cooling process. To make ganache, all you do is add hot heavy cream to chocolate and mix together to make a creamy, fudgy sauce. BUT! There’s a key step needed to ensure the ganache isn’t grainy. You must let the hot cream sit with the chocolate for at least 5 minutes before stirring. These five minutes help the cream slowly melt the chocolate so once you stir, it’s super creamy and comes together easily. And there you have it – January’s incredible cookie recipe. I have one more comfort food recipe coming up for you before we head into “healthier” options to keep your diets in check. Come back on Thursday to check out what’s in store! Buttery shortbread cookies sandwiched with chocolate ganache and striped with chocolate. In a medium bowl, whisk together flour, baking powder, and salt together until combined. Set aside. Add butter to a large bowl fitted for a stand mixer. Using the paddle attachment, beat butter on medium until light and fluffy, about 1 minute. Add sugar and beat for 2 more minutes. Add egg and vanilla to mixture and beat until combined. Add flour mixture to butter mixture just until the dough forms. Separate dough into two halves (I use a food scale to make sure it's exact). Place one half of dough on a piece of parchment paper. Roll out into a 1/4 inch sheet of dough (it doesn't need to be a specific shape). Repeat with other half of dough. Place one parchment paper with sheet of dough on top of the other and then place on baking sheet. Place in refrigerator for 1-2 hours. If you must chill longer, place plastic wrap on top layer of dough to prevent drying. When the dough is ready, preheat oven to 350 degrees. Remove one sheet of dough from fridge and place on counter. Using a 2-inch round cutter, cut as many circles as possible. Place circles on a cookie sheet lined with parchment paper about 1 inch apart. They will barely spread so 1 inch is more than enough space between cookies. Gather dough into a ball and roll out again and cut more circles. Repeat until most of the dough is used. You should have about 36 rounds. Bake cookies in preheated oven for 10 minutes, or until edges of cookie are slightly golden brown. While cookies are baking, take second sheet of dough from fridge and begin cutting rounds and place on baking sheet. Now, we'll cut out the centers to make the tops of the cookies. Using a 1-inch cutter, remove centers from the cut rounds. Gather all the dough scraps and roll them out again and repeat cutting process. You should have 36 tops. Bake cookies for 9 1/2 minutes (the tops take less time to bake). Remove cookies from oven and let them cool on baking sheet for 5 minutes and then transfer to wire rack to finish cooling completely. To make the ganache, place 3 ounces of chocolate into a small bowl. Heat heavy cream in the microwave for 30 seconds, or until steaming. Add to chocolate and let it sit for 5 minutes then whisk together until smooth. Let it thicken for 5 more minutes. Add 1/2 teaspoon of ganache to the bottoms of the cookies and place a top on top and gently squeeze into a sandwich. Repeat with rest of the cookies and ganache. Finish the cookies by melting the remaining 3 ounces of chocolate. Place chocolate into a small sandwich bag. Snip off a small corner of the sandwich bag and begin to drizzle chocolate over all of the cookies. Let them sit until the chocolate hardens (or place in fridge to help it harden faster). Serve immediately for store in storage container for up to 3 days. So obsessed with these! I could eat about a million right now. They look so good! Shortbread cookies are my ABSOLUTE favorite. And I’m a chocolate lover! YEAH! I’m glad I’m not the only one who didn’t start off the new year perfectly healthy! These look amazing! Cant wait to try them! Yay for being unhealthy (at least for one more week)! I agree! Getting back to the work routine is brutal, I baked some cookie sandwich as well 😉 . Yours look amazing! And you can’t beat shortbread and chocolate! My mom makes amazing shortbread cookies stuffed with chocolate ganache, but the ganache is all on the inside, making for unattractive cookies. I love what you’ve done with yours! The stripes definitely help hide any imperfections, that’s for sure! I love all the chocolate you have going on in here. Not just on top but also in between them – YUM!! Yessss! That’s what drew me to these cookies, too! Yesss! I completely agree with this! Thanks so much for the love! Oh my gosh, I LOVE fudge striped cookies. These look absolutely incredible! These are gorgeous! What a pretty cookie to bring to a cookie swap or as a holiday gift! Aw thanks so much! I definitely agree! 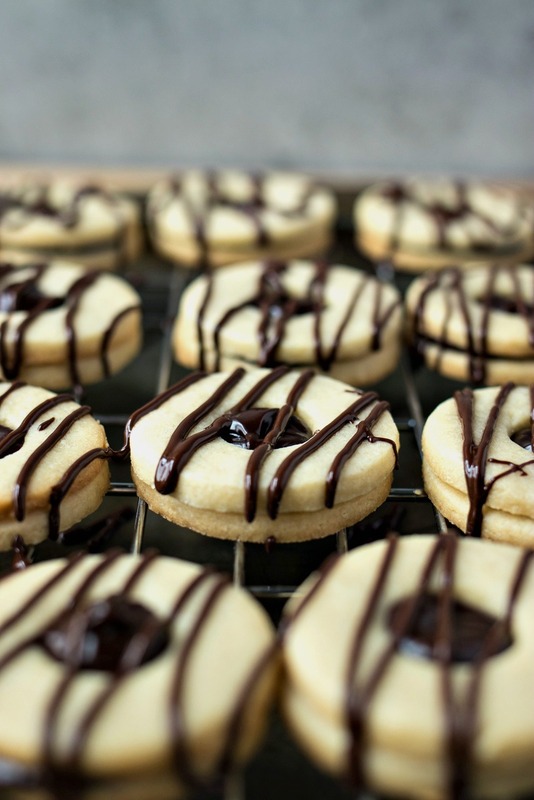 I have a weakness for shortbread cookies and with the chocolate drizzle and filling this looks like heaven. Can’t wait to make these! Heaven is right! Let me know how you like them! These look so yummy and easy enough to make!! Chocolate ganache is a perfect paring for the buttery shortbread cookies. These are perfection! There is nothing better than short bread cookies especially with chocolate in the middle and drizzled on top. These wouldn’t last very long in my home. I pinned these! My kids will devour them! Of all the cookies out there, I have never seen anyone do this! They’re so fun to make! The whole family will love them!